Black-bellied whistling-ducks are a flashy chestnut bird with a bright orange-red bill, pink legs, and white wing spot. Both sexes look alike. Whistling-ducks are not actually puddle ducks, but tree ducks. 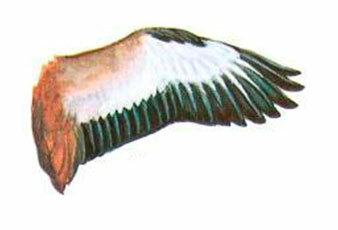 Black-bellied whistling-ducks are currently undergoing a range expansion. Their range consists of large portions of South America and along the coast of Central America. Today, in the United States, Black-bellied whistling-ducks are mostly found along the Gulf Coast, the southern portion of the Mississippi River, and the Florida Panhandle. In South Carolina they are found primarily along the coast, mostly in the southern portion of the state. They have been reported as far inland as Aiken county and as far north as Georgetown county. These whistling-ducks can be found in shallow freshwater ponds or lakes, often those containing water hyacinth, water lilies, and cattails. 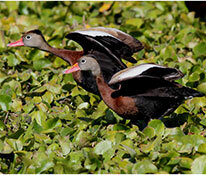 Black-bellied whistling-ducks eat mainly plant material, including smartweed, grasses, sedges, bindweed, and nightshade. They will also consume agricultural crops of sorghum, rice, corn, millet, and wheat. Aquatic animals, such as snails, insects, and spiders are also consumed in small amounts. 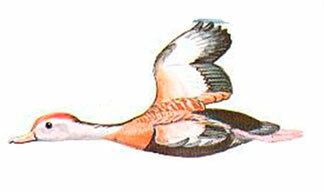 Whistling-ducks are cavity nesters, but they do not excavate the cavity. Both the male and female select the cavity. These ducks will also nest in nest boxes, and have been known to nest on the ground occasionally. The hen lays 9-18 creamy white eggs. Formerly known as tree-ducks, this species actively nests and perches in trees. Appear to exhibit no territoriality. Highly social and can be found in large flocks in areas where they are common.